INTERACTIONS: People who encounter the shichinin misaki almost always die shortly after. Frequently this take the form of a mysterious and deadly fever. 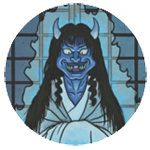 These victims join the ranks of the shichinin misaki, replacing the spirit responsible for killing them. Some say that the replaced spirit is then finally able to attain Nirvana. Thus, the number of spirits always remains fixed at seven. ORIGIN: The word misaki (御先) means “one who goes before,” and has a number of nuanced meanings. One of these refers to the retainers and servants who would travel in front of a noble or priest’s procession. Another refers to divine animals, particularly ravens, foxes, monkeys, who acted as messengers in the service of higher ranking spirits. Finally, it can refer to spirits (bōrei) of those who died unnatural deaths, and who are able to possess and control the living. Misaki (岬) can also refer to a cape or a peninsula, which might describe why the shichinin misaki are so frequently encountered at the borders between land and sea. There are a number of theories about how this self-perpetuating group began. Because they are usually encountered near water, it is said that they may be the ghosts of drowning victims. Some theories describe them as the spirits of Taira soldiers who died in a boar trap while fleeing their enemies during the Genpei War. Others attribute them to the spirits of seven wicked priests who were murdered by a group of townspeople they were tormenting. Others say they are the spirits of seven women pilgrims who were thrown overboard at sea and drowned. The most popular story about the shichinin misaki comes from Tōsa Province (present day Kōchi Prefecture) during the Sengoku Period. Kira Chikazane, a senior retainer and nephew of Chōsokabe Motochika. 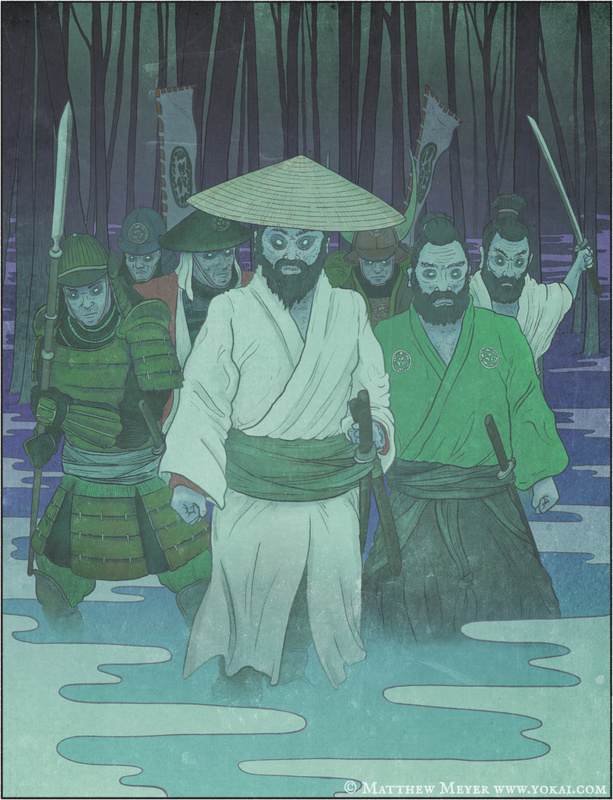 During a crisis of succession within the Chōsobake clan, Chikazane opposed his lord Motochika. As a result, he was later ordered to commit seppuku. Chikazane’s seven retainers also followed him into death by suicide. After that, strange occurrences were reported around the graves of Chikazane and his retainers. These were attributed to their restless, vengeful spirits. Hearing the story of the shichinin misaki, Motochika performed services to appease the restless spirits of Chikazane and his retainers. He built a shrine in Chikazane’s name, which still stands today (the Kira Shrine in Kōchi City); however, none of these had any effect at stopping the vengeance of the shichinin misaki. 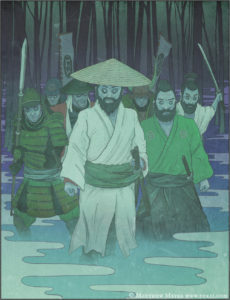 Even today, the shichinin misaki are said to haunt Western Japan and Shikoku, and Kōchi City in particular. Traffic accidents and other strange occurrences are blamed on the restless spirits of the shichinin misaki.